Marshmello is an American EDM DJ and producer based in Philadelphia, Pennsylvania. He was born on May 19, 1992, and given the name Christopher Comstock. His primary genres of focus are trap, future bass, and progressive house. He entered the music scene in 2015 upon the release of his song WaVeZ via SoundCloud. He continued releasing songs and eventually caught the attention of Skrillex and other EDM DJs. He performed at several festivals and events that year. He released his debut album, Joytime in 2016 on his label Joytime Collective. The album hit the Billboard Electronic/Dance Music chart and peaked at the number 5 position. His single Alone was released that same year and became a massive hit for Marshmello. The video garnered more than 800 million views on YouTube, and it was certified platinum by the RIAA for selling 1 million copies in the USA. It sold more than 80,000 copies in Canada too where it charted on the 56th spot on the Canadian Hot 100 chart. Marshmello wears a helmet which masks his face during performances. This led to speculation over his identity. After his performance at the 2016 Electric Daisy Carnival Festival, he teased a reveal by removing his helmet. The person under the helmet though was Dutch DJ Tiesto. People had speculated that Comstock was Marshmello. Forbes confirmed his identity in late 2017 after taking into account several things such as the given name under which he registered with BMI, tips from industry insiders and other factors. His helmet was inspired by Canadian house producer deadmau5, as well as French house duo Daft Punk, who wear helmets during live performances. Deadmau5 publicly expressed his disapproval of Marshmello’s music on Twitter and via interviews with outlets such as Billboard, citing lack of creativity as the main reason why he dislikes the hype around the young artist. 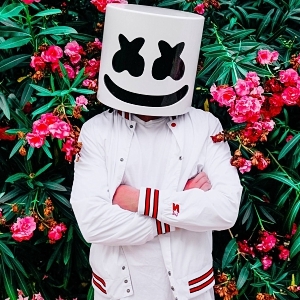 Marshmello’s second studio album, Joytime II was released on 22 June 2018. Two singles preceded it, Tell Me and Check This Out. He has been nominated for various awards, including an IDMA for and Electronic Music Award. He’s closed affiliated with Skrillex and has collaborated with Khalid, Logic, Juicy J, Slushii and Selena Gomez. Marshmello is a macOS user, and his primary DAWs are Ableton Live, and Logic Pro X. Monitoring duties are handled by Yamaha HS8, Yamaha NS10 and Eve Audio SC208 monitor speakers. The Universal Audio 6176 channel strip hardware unit has been spotted close to Marshmello and is believed to be one of the effects units he uses for processing audio. A Universal Audio Apollo Twin interface handles some of the A/D input and output duties in his setup. On the software side of things, his production arsenal consists of many popular plugins like Xfer Records Serum, Massive, reFX Nexus 2 as well as Reveal Sound Spire. His DJ setup runs on popular hardware such as the Pioneer CDJ-2000 Nexus, Pioneer DJM-900 Nexus, Native Instruments Traktor Kontrol S4 MK2 and Pioneer DDJ-SH Serato Intro controller. What kind of headphones does Marshmello use? What kind of studio monitors does Marshmello use? What kind of laptop and computer does Marshmello use? What kind of DJ setup does Marshmello use? What kind of keyboards & synthesizers does Marshmello use? What kind of music production software does Marshmello use?